Air Tool Lubricants are designed to help tools have an effective and long-lasting life. These air tool lubricants are manufactured by Lucas Oil and provide effective results of high quality lubricants. The air tool lubricants available here at SpraySmarter.com are produced with an efficient blend of pure petroleum and additives that serve to protect against rust while lubricating tools. Additionally available are chain oil lubricants that function to protect and lubricate chains, sprockets, cables, and gears. 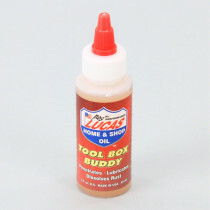 Lucas Oil Air Tool Lube & Tool Box Buddy; 2 Oz.